For fifteen years now, I have been subscribing to the New Yorker. During that span of time, there have been maybe three instances—four, tops—in which I have not greeted the arrival of yet another issue of the magazine by plopping the new week’s issue upon a vast pile of previous weeks’ issues. A very good friend of mine, who, at the time, was also a longtime subscriber to the New Yorker, and also, incidentally, unable to keep up with the barrage of unstoppable arrivals flooding his mailbox, once began to refer to every new issue of the New Yorker as “the dead rat,” due to its unassailable, somewhat onerous presence in his mailbox. Plang! The flap of the mailbox just slammed shut. What’s new? Oh, yes. The dead rat has arrived. Add it to the pile. The main culprit in my chronic struggle to maintain a current reading schedule with the New Yorker is the fact that I insist on reading every single thing in the magazine, cover to cover. I read the listings for what bands are playing at what clubs, what new building by what new architect is currently being built to house what new condo complex, and what new restaurants are opening. You may think I am insane to take on such a seemingly worthless endeavor, but let me tell you something. 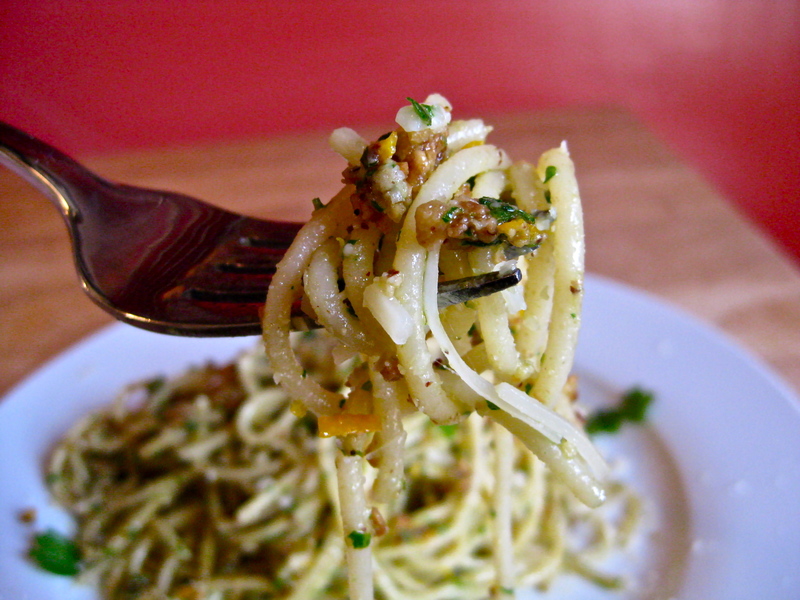 Had I not insisted on reading a review of a new restaurant that opened up in the West Village, I would have never read about that restaurant’s offering of a small, delicious plate of crusty bread topped with hazelnut orange pesto. Not helping my reading situation at all, as soon as I read about the combination, I put down my magazine to make it. Not surprisingly, the pairing of the two elements is absolutely fantastic. 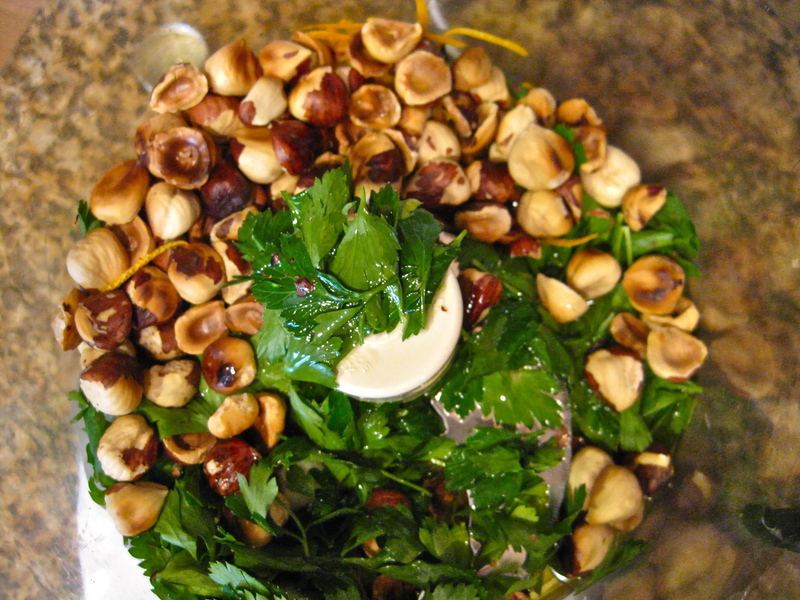 The robust flavor of the toasted hazelnuts gets a nice brightness from the orange zest, and when whirled together with a generous glug of olive oil and a large handful of Italian parsley, the pesto comes together as a well-rounded, satisfying sauce for pasta, topping for crostini, or even a nice embellishment to a pile of sautéed greens rested upon a bed of thick, belly-warming polenta. I savored each bite of this warm, filling meal, and I am not the least bit ashamed to admit that while eating it, I cracked open an old back issue of the Atlantic. From September 2010. Don’t worry. I’ve let that subscription lapse. 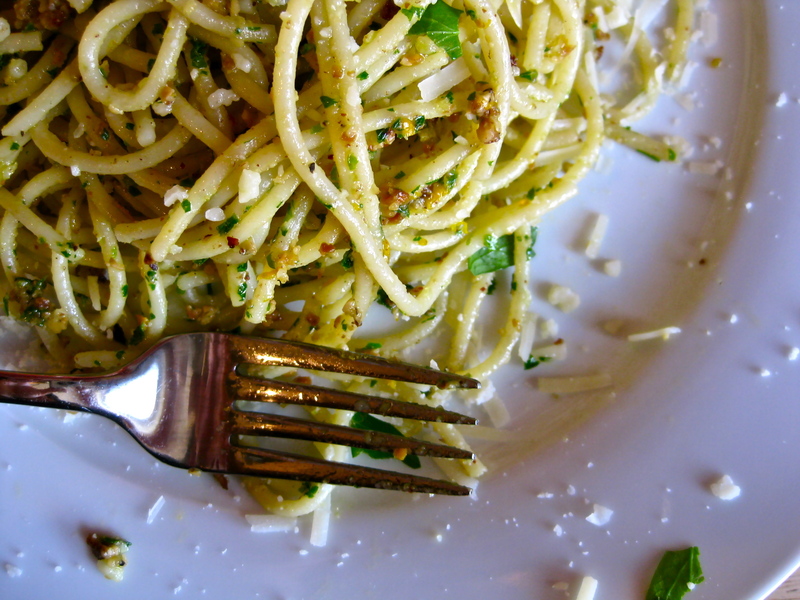 If you are going to make this pesto as a sauce for pasta, reserve about ½ a cup of the pasta’s cooking water to add into the pesto when you toss it with the pasta. 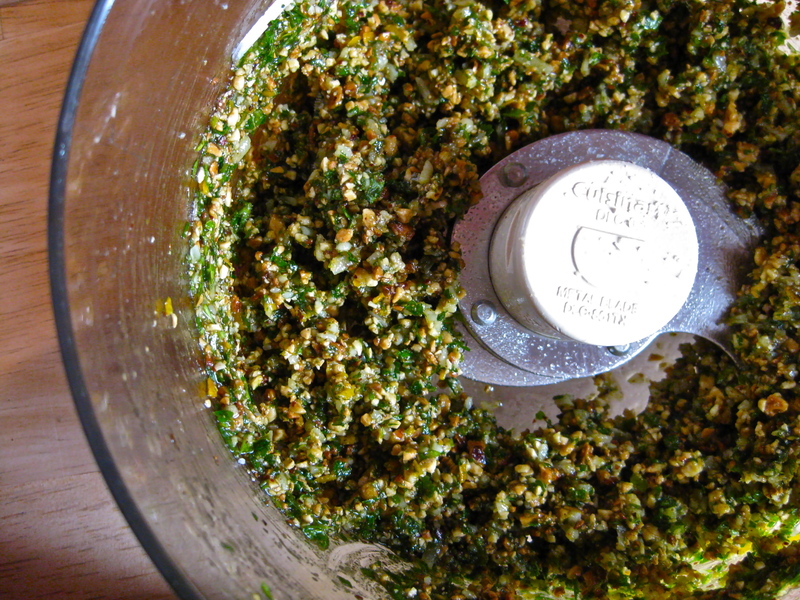 This will help the pesto loosen up a bit and maintain more of a sauce-like consistency. Preheat oven to 350 degrees Fahrenheit. 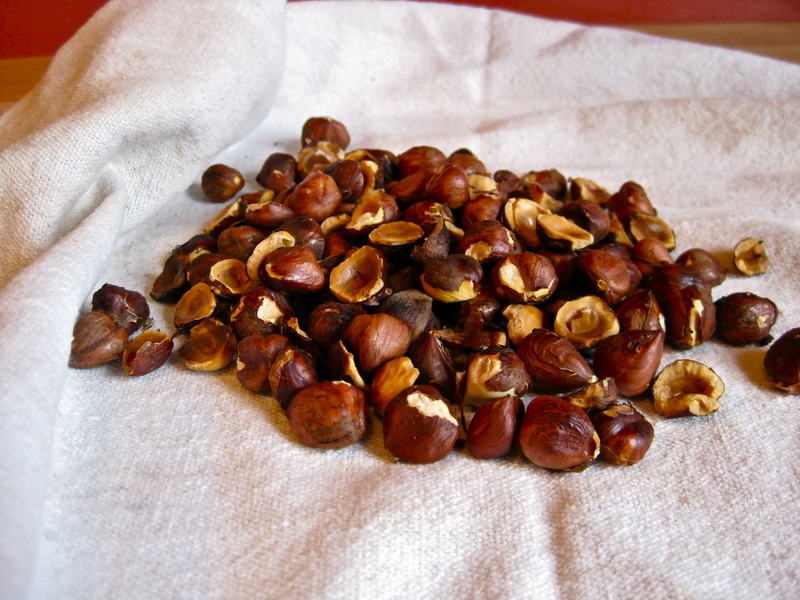 Place hazelnuts on a baking sheet, and toast for 15 minutes, until the nuts are golden brown and the skins are beginning to peel free. 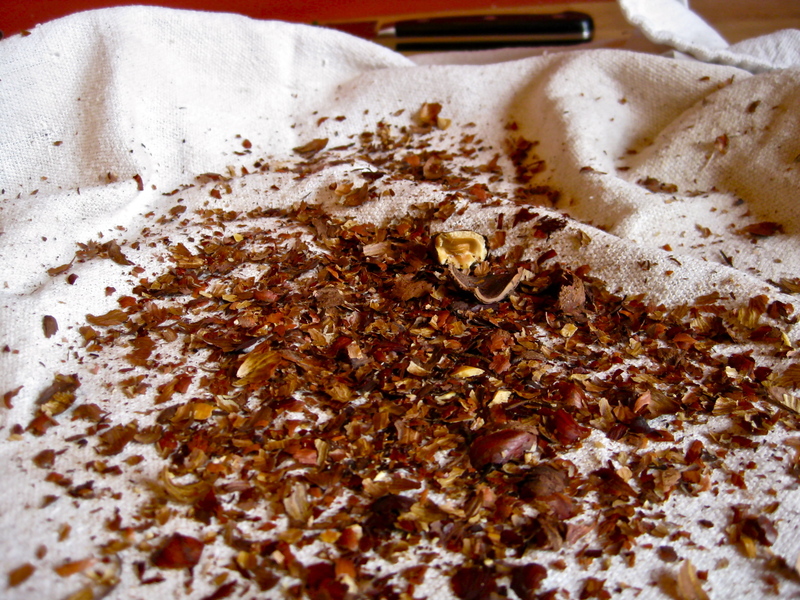 Remove the toasted nuts to a clean dishtowel. 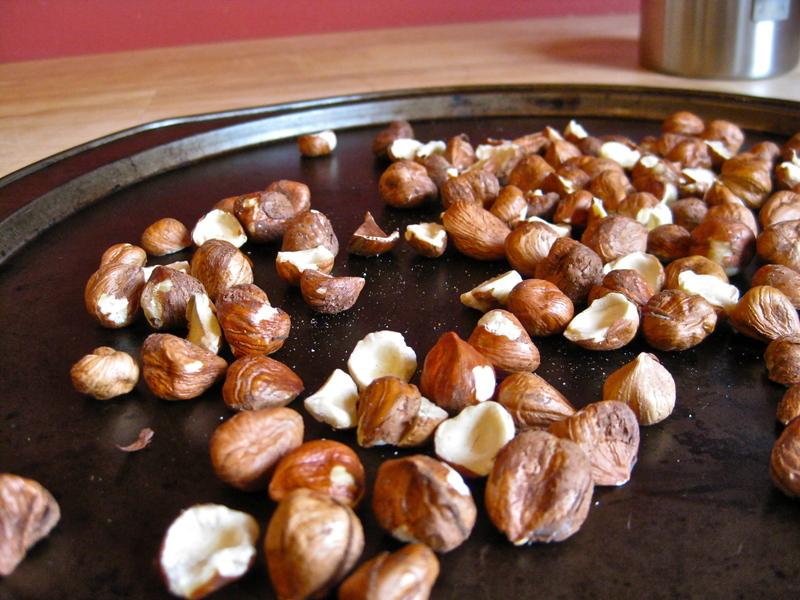 Fold the dishtowel over the hazelnuts, and vigorously rub the towel around to slough the skins off of the nuts. If you don’t remove all of the skins, don’t worry. You just want to remove enough of the skins to ensure that your nuts won’t taste too bitter. 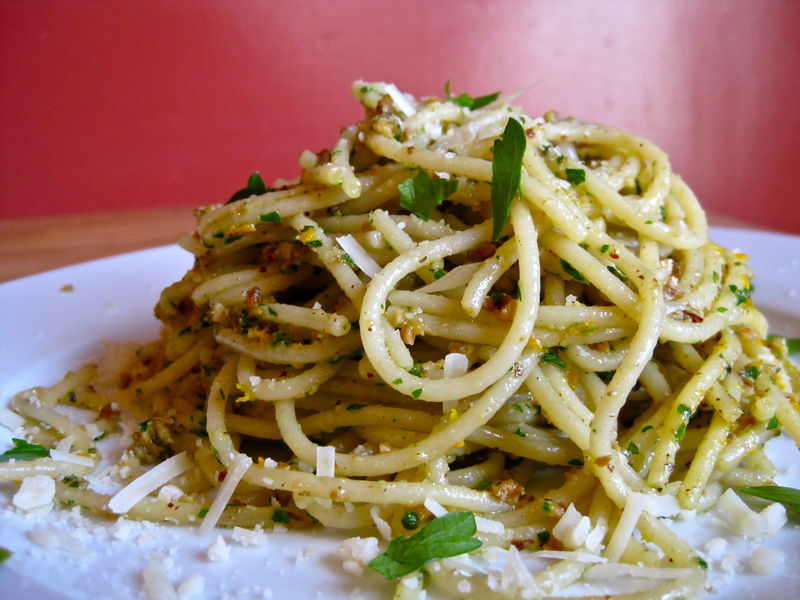 In the bowl of a food processor, combine the nuts, parsley, garlic, orange zest, Parmesan cheese, and ¼ cup of olive oil. Pulse the mixture for about 20 seconds, until the ingredients are chopped and the nuts still have a good amount of texture (if you process the mixture too long, the hazelnuts run the risk of turning into a paste). 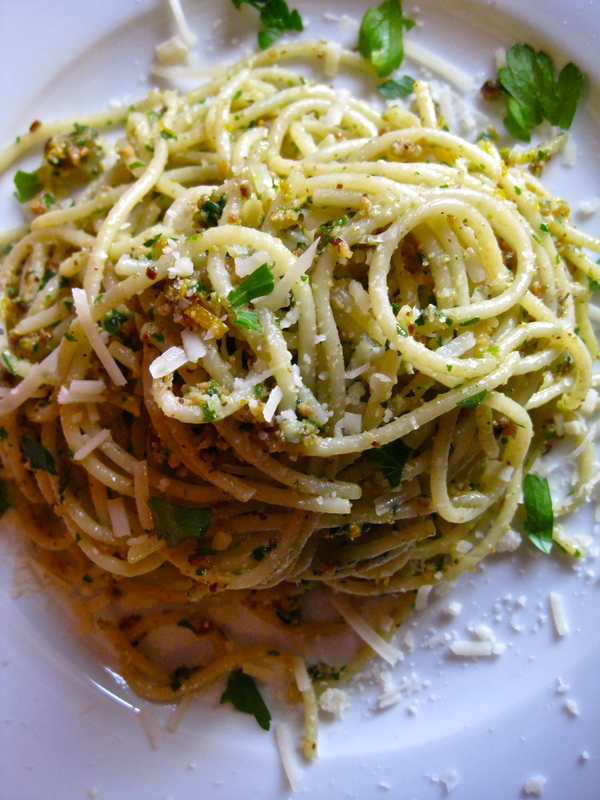 If the mixture looks a bit too sturdy, add in the remaining olive oil, one tablespoon at a time, pulsing briefly after each addition until the pesto reaches your desired consistency. Add salt and pepper to taste. 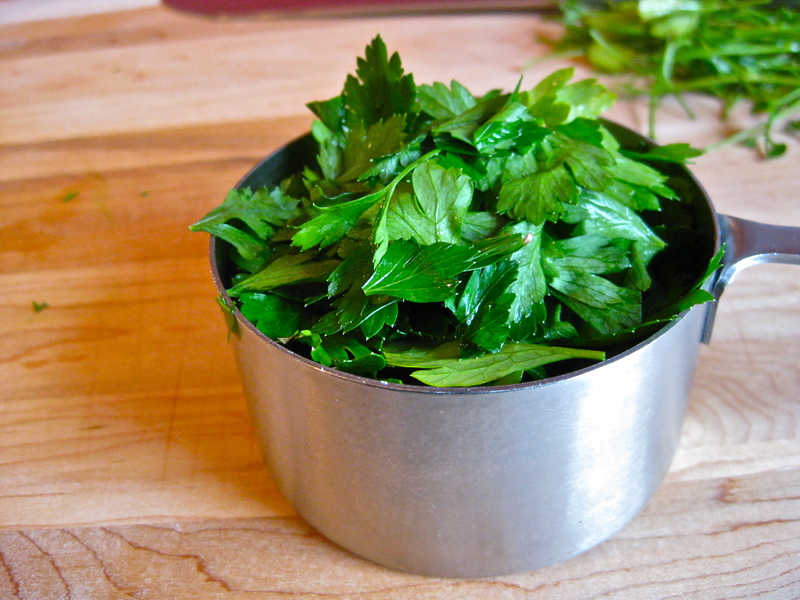 Use as a topping for crostini, a sauce for pasta, a dressing for greens, etc. I’ll bet this would taste great dolloped on top of a nice firm piece of white fish. And this is why I don’t subscribe to magazines… OK, seriously, what a wonderful idea. I love how this is fresh and zesty and just screams winter too. Great dish. I am EXACTLY like you with the New Yorker. My husband says I am tyrannized by it–every so often I catch up, take a breath, and there are four more. How weird is it to be relieved when your favoriate magazine sends a double issue so you know one is not coming next week? 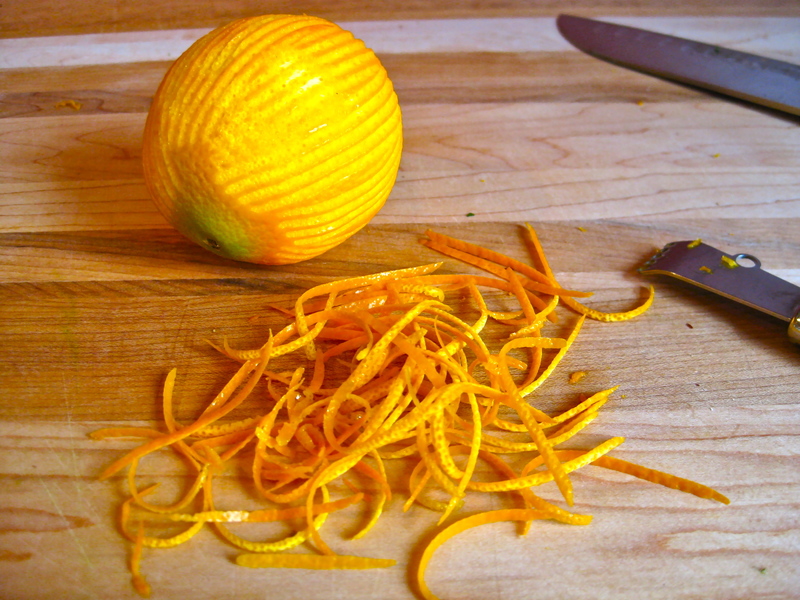 Also, this looks delicious–the orange so luxuriously aromatic! It’s good to hear other people chime in with their own tales of trying to keep up with the oppressive overlord that is the New Yorker. I so hear you on the double issue thing. It’s like you are reading my mind. Glad to know I’m not the only one who uses the Two Tables column for food inspiration. I read about an English muffin sandwich with miso mayonnaise and fresh mozzarella a few months back and has been on my to-do list since. I even found a recipe for homemade English muffins! Ah, ha!! Now I know what to make for dinner tonight! We’ve got hazelnuts, parsley hanging on in the garden, limes & lemons if not an orange (I’ll let you know how that goes) – even a wedge of Parmesan in the fridge. Someone must have brought the cheese at Christmas; I’ll grate it onto my portion surreptitiously tonight as we’re officially very low-fat around here. Foods such as little wedges of wandering Parmesan don’t escape my notice any more. Did we tell you about our kitchen change? We have two new fridges – two Danby 4.4 cf mini-guys, installed on top of a new counter. No more bending over to search for things, no more surprise science experiments. So far, even over the holidays, it seems enough room. So glad to have found you on-line. Bookmark bar fave.